Hello and welcome back Dies R Us friends. Lena here today to share a masculine birthday card that I made for my Uncle. Since it is going to be put in the mail to go overseas, I didn't want to add any embellishments that would make it bulky. I began by adhering a piece of double-sided adhesive sheet to a piece of black cardstock. 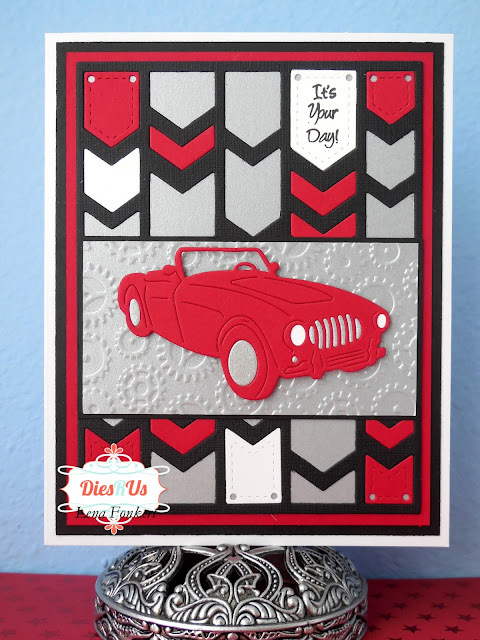 Using the Elizabeth Crafts Chevron Background die, I cut the background for my card. I peeled the backing off and adhered it to a piece of silver cardstock. Don't throw the adhesive backing away - you can use it as a stencil on another project. I also used the same die to cut a chevron background out of red and out of white cardstock. This time I did not use any adhesive paper. 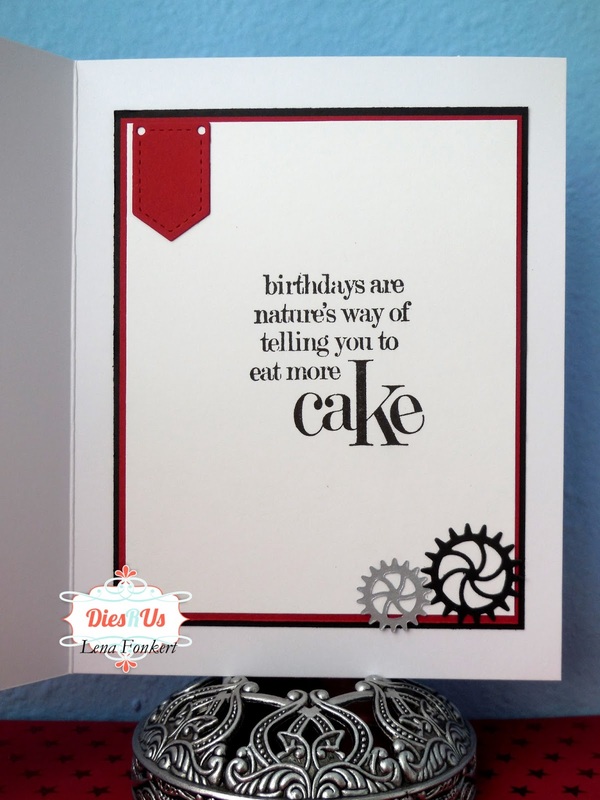 I then cut a 2" strip of the silver cardstock and embossed it with a Gears embossing folder. Next came the car which was cut with a die from Frantic Stamper called Convertible Roadster. As you can see, I cut out the card out of red and of the silver cardstock. This is because I wanted to paper piece the wheels and the front of the card. Then it was time for the fun part. I used some of the banner cut outs of the red and white cardstocks and paper pieced them onto my original background to give it some colour and create a fun pattern. After adhering the embossed strip to the background die, I pop dotted the car using foam tape to add dimension but still keep the bulk to a minimum. 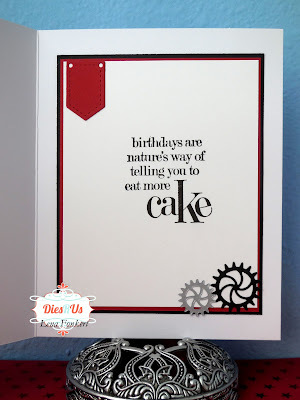 As you can see, on the inside of the card, I stamped my message and added another one of the banner cut out pieces from the Chevron Background die. I also added a couple of gears which I cut using the Gears die from Memory Box. I hope my post has inspired you to use your dies to add a few masculine cards to your stash. Now it's your turn to come play along at the Dies R Us Challenge Blog for your chance to win a gift voucher to the Dies R Us Store. A new challenge begins on the first and fifteenth of every month. Be sure to Follow Us on Facebook too. Love the bold and masculine design. What a great card! Love the masculine look and that fabulous background! WOW what a fabulous masculine card ... inside & out! Great tips too! Thanks so much for awesome inspiration today Lena! Great masculine card; love the design. Wow, this is a fabulous masculine card, Lena! Lots of piecing together. Looks amazing. this is a fantastic card! so striking!